I love the Dragon Quest series, and have done for years, and so it is with great joy that I beheld the announcement of Dragon Quest XI: Echoes of an Elusive Age, especially after the western absence of the MMORPG Dragon Quest X. But, after such a considerable wait for the West since 2010’s Dragon Quest IX: Sentinels of the Starry Skies, how is the game and series faring? The opening of Dragon Quest XI is one that has all of the hallmarks of a classic epic adventure. An ancient town in celebration, an evil presence spreading across the skies, a running woman with a child of special origins, and a kindly old man to take that child in when everything invariably goes wrong. All of this before the end of the opening cutscene, and the perfect scene for this adventure to start. The player, otherwise known as ‘the hero’, awakens in the quaint town of Cobblestone, on the morning of an ancient ceremony to bring him into adulthood. With his childhood friend, Gemma he completes the ceremony and discovers that he is the Luminary reborn, and leaves his childhood home to journey to the great city Heliodor to uncover what that means and to chase down his destiny. Albeit this all sounds like a pretty typical hero plot, but after these points the story begins to unfold in increasingly surprising ways as you explore the world of Erdrea and meet the colourful cast of characters and NPCs therein. The wonderful thing about Dragon Quest as a series is often the playable roster, all of which have clear motivations for joining the hero, and feel like richly written, fully-fleshed out characters in their own right; and XI doesn’t break this tradition. As with most JRPGs the bulk of the gameplay is divided between exploration and combat. The larger of these is the exploring, which will see you running around lush open fields, acrid deserts, dense forests and bustling towns. All of the usual trimmings are here, such as chests and the like, along with increased exploration options over other games in the series allowing the hero to climb ropes and jump across roofs to find all of its secrets. If you get lost in Dragon Quest XI, you can bring up the map to full screen, which will show the entire area that you are currently exploring (or can be zoomed out to show the whole of Erdrea, if you fancy that). A small wonderful detail with the map, is that when it is opened, the hero appears as a pointed icon that can still be rotated on the spot, giving the player the opportunity to orientate themselves far easier. Even if you spend a time away from the game, Square-Enix have got you covered. Every time you boot it up, there will be a brief narrative breakdown of the last few events that have occurred so that you can start each session with a destination or objective in mind. If that is lost on you too, there’s even the ability to select Party Chat from the menu to discuss the current situation with your party members and get tips that way. This could come across as overly hand-holding, sure, but instead I personally found this to be incredibly helpful in getting me back into the game and also it’s good to have three methods of aiding the player in not getting lost, especially in a huge game like this. Also, it can’t be overlooked that, most importantly, of the three methods of stopping running in aimless circles, two of them can be avoided entirely. In terms of NPCs, it’s still advisable to talk to everyone you see as with most JRPGs, but the game has streamlined this process by placing on the aforementioned map icons to signify certain points of interest such as quests, which show as purple dots, but the most useful of these are the pink dots. Pink circles on the map will always show a person whose dialogue will essentially tell you how to progress. Other alterations have been made to the basic exploration in Dragon Quest XI that all change the series for the better. From pretty much the beginning of the game, you’re given a horse, which can then be summoned to wherever you are from any bell and makes travelling so much quicker. Also, there’s now an auto-run feature which you can activate at any time and will make the hero just run in a straight line until told otherwise. Both of these changes make traversing the world so much less painful than a lot of JRPGs. As you progress through Erdrea, and level up through battles (more on that in a moment), your characters will grow stronger and gain skill points, which can be used in the Character Builder menu. This is where the player can affect the composition of their team. Each character can use different weapons, and the player can use the points in the game to unlock new skills with those weapons, such as increased critical rate or weapon specific abilities. 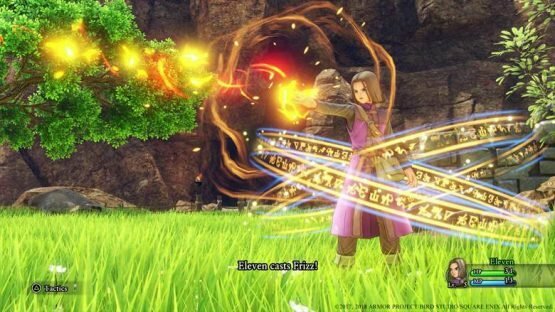 Back to the battles; Dragon Quest XI does not have random battles, placing the encounters as enemies in the field that can be avoided if the player chooses, but also can be preemptively attacked with your sword to not only pick your battles (literally) but also to start the battle with a certain amount of damage already done to the creatures in the battle. This obviously can give a tactical advantage, but most importantly it’s unbelievably satisfying to nail it each time. In battle, the combat plays out in classical turn-based fashion, with the player taking turns to attack, defend or various other skills. All of the series combative elements return, with the more playful magic and ability names contrasting with more serious JRPG tropes. The one marked difference from prior games in the series is in the Pep system, which operates in a similar fashion to that of the Trance system in the iconic Final Fantasy IX. Pep is a state that the playable characters can enter, in response to particular stimuli (such as damage taken), which enhances certain attributes of that character during the time it is active. Unlike Trance, if it is not over by the end of a battle, it lasts into the next battle. However, you can end it prematurely with a Pep Power, an attack or ability that uses up the remaining time the character is in Pep and often requires more than one character to be in Pep state. This then gives additional strategy to the basic battle structure, as although you can’t choose when to activate it, you have a modicum of control over when it will end. Will you choose to remain in Pep with a character in the hope that another character will go into the state allowing the use of a Pep Power, use a solo Pep Power to reset the character, or just use the character as normal with their Pep-induced stat boosts? The onus is on the player to decide how best to use these powers. As a small change in battles, on your characters turns in this title, you can move around the arena and even activate running from the battle by running against the edge of the arena. Albeit, this additional movement has little-to-no impact on the actual combat itself, but it’s definitely more interesting both mechanically and aesthetically to not be static. However, it does strike me as odd that the developers have chosen to alter a fundamental aspect of the series’ structure with no real reason for doing so. Whilst on the subject of nonsensical decisions or negative points to the game, the inventory management in the game remains unchanged from the series standard, so any items that are in a particular characters inventory are the only ones that can be used in a combat scenario. This is immensely frustrating when you have Medicinal Herbs in the Items Bag that the game won’t allow you to use as the character in question isn’t holding them. As I say, this is a series mainstay, but it’s something I really would have rather changed by now. To balance that niggle with a good change for the series, however, the characters are introduced in a great fashion in that they travel with the party so a short while engaging in battles whilst not being part of the team. This gives the player a decent impression of how the character plays, so they can make a more informed decision as to whether to bring this new member of the playable roster along. Combine this with the ability to pick and choose the strategy of your battles and whether you control the other members of your party or leave them to their own devices, then you have a fantastic way of easing the player into any new mechanics that are brought by the newer characters. For instance, I play very aggressively and struggle to heal effectively, and so have left Serena to AI, and benefited greatly from this. All-in-all, the gameplay fits a pleasantly comforting niche in my head. It keeps very rigidly to the structure of classic JRPGs, but yet has enough new ideas and different spins on existing ones so as to feel like a new game despite it’s arguable mundanity on paper. The combat is fluid and unobtrusive and, nonsensical movement options aside, feels fresh but familiar. Also, Dragon Quest XI is masterful in making finding its secrets (like Mini Medals – yeah, they’re back) a joy instead of a chore. I’ve discussed all of this and yet still not covered everything the game have to offer, with a wide variety of game-changing options in Draconian Mode to grant greater challenges to the player, and a host of other touches in the game that I don’t want to spoil (all I’ll say is to keep a look out for enemies in the field that are gently sparkling), Dragon Quest XI has a tremendous amount of content available. Aesthetically this game is stunning, beyond an absolute doubt. The highly stylised Toriyama art style is absolutely stunning realised in full-3D like this, giving beautiful nostalgic flashbacks to the phenomenal eighth main instalment of the series. All of the character designs are unique, whilst being beautifully familiar thanks to the wonderful Toriyama designs giving the whole package the feel of being a love letter to the series in a fashion. On this note a lot of, if not all of, the iconic creature designs return in Dragon Quest XI. All of the familiar creatures, like the Slimes, Drackies, and Flythons are all back and joined by some exquisitely designed new creatures and bosses. This synthesis works so well that, at times, I had trouble remembering whether certain creatures had existed before in the series or whether they were entirely new, which speaks volumes to the consistency of design. Even the sound design fits within this beautiful mix of the new and familiar. All of the music, excluding that iconic series theme, is new and yet all sounds like Dragon Quest music, if just tonally. All of the sound effects, however, are most definitely exactly the effects you entirely expect from the series (if a little better quality than the ones of old). All of the chimes, bleeps, and sound bites are present, and I mean all of them. This could come across as uninspired or worse, and with many games would be exactly that, but with Dragon Quest XI and with the legacy that comes before it, it instead acts like an aural comforting blanket. There’s something immensely gratifying about running around a new world with new scores playing in the background and with all of the sound effects being exactly what we expect. Finally on the sound design, this iteration is some incredible voice acting, with all of the core cast (excluding the protagonist) and each NPC of notable narrative importance being fully voiced. Each village that you visit has a different accent, some of which are glorious to listen to, giving the world a great deal of depth. Furthermore, certain characters, like Erik for instance have such phenomenal voice acting that it really rounds the character. There are, as is often the case in voice-acted JRPGs, there is battle dialogue from your characters in battle. This can be frustrating if overused, as it almost always is in other games, but Dragon Quest XI doesn’t do this. You have comments and quips from your team, sure, but they are occasional and because of this instead work to improve the dimensionality of the characters and the overall charm of the game. So, should you buy Dragon Quest XI: Echoes of an Elusive Age? If you are a JRPG fan, this is an absolutely essential example of the genre. The mix of familiarity and innovation comes together to create a beautifully orchestrated experience. It’s not without its shortcomings, true, but overall it’s a charming adventure that’s an undeniable joy to play. Any problems I might have with the game melt away in the face of all that I love about it.